Boulder will be reveling in the last few weeks of winter! Festivals, parties, St. Patty’s Day celebrations, concerts, arts events and so much more. Say farewell to winter and bring in spring with these 31 events happening in and around Boulder in March. Where: Many Restaurants in the Boulder Area! Click here for the list. Denver Restaurant Week is BACK! Over 230 participating Denver restaurants have crafted delicious menus for you enjoy at one of the chosen price levels; $25, $35 or $45. There are 18 restaurants in the North Metro/Boulder area that are participating, including Boulder Chop House, Jill’s Restaurant & Bistro, Boulder Cork, The Melting Pot, Via Toscana, Village Tavern, 740 Front and more! For more info, click here. Cost: $8 general public, $5 Museum members. Signature drinks, wine, and beer available for purchase. As a complement to the Longmont Museum‘s current WWI exhibition, WWI: Longmont & the Great War, the museum is presenting a series of films that illustrate life during this era. Films include The African Queen, Wonder Woman, All Quiet on the Western Front and War Horse. See the full schedule here. All movies are specially paired with a signature cocktail, and galleries are open (5 – 9 PM) to enjoy for free with your film ticket. Purchase tickets online here (please note: online ticketing currently only works well on desktop and laptop computers, not on mobile), by calling the Museum’s box office at 303-651-8374, or at the door. Check out Louisville’s First Friday Artwalk in March, Luck of the Irish. Irish immigrants were drawn to Colorado for its mining and other work opportunities, and they helped shape Colorado’s future. At this event, we’ll take a close look at the Irish men and women who came to Louisville and their impact on our town. Cost: General Admission, $45, VIP $70, Designated Driver, $5. Tickets available here. Winter Craft Beer Festival was created to get you out of the house for some fun during the cold of winter. Sample beers from all your favorite local Boulder, Denver and Ft. Collins breweries, including O’Dell, Great Divide, Oskar Blues, Sanitas Brewing, Epic, Mama Bear’s Brew and so many more! Enjoy live music, fun and games. Food trucks will be around to keep you happy! General admission includes a souvenir glass and all the beer you want to sample, VIP tickets will get you that plus one hour early entry (12PM), exclusive access to rare and small batch beers. Denver Drum and Dance, Boulder Drum Circle and DjemBlaze is hosting Winterblaze: Full Moon Fire Jam at Vali Soul Sanctuary. Drumming, dancing, a huge fire, no curfew and no cover charge! The fire pit is on the BACK of the property, past the main parking lot. Bring a chair and wear plenty of layers. Fire safety equipment will be available. Cost: $7 Children/Seniors/Veterans, $10 Adults. Tickets available here. Bella Gaia at the Fiske Planetarium is a globally recognized immersive experience created by award winning director, composer, and violinist Kenji Williams. Amazing imagery of the Earth from space, data visualizations, and stirring live performances of music and dance from around the world are threaded by an orbiting flight path and stunning NASA imagery from the International Space Station. Described as a silk road experience expanded to a global scale, the award winning “Bella Gaia” tells a cosmic story, exploring both human and natural expressions of the living universe, illuminating the relationship between human civilization and nature as we enter the Anthropogenic Age. Cost: $50/ adult, $90/couple, tickets available here. Use promo code “VisitEstes” for $5 off each ticket! The Whiskey Warm Up celebrates the winter tradition of warming up from the inside out. Layer up to sip on selections of Colorado whiskeys from a variety of distilleries while cozying up near of one of the fire pits outside in the beautiful George Hix Riverside Plaza. Sway to the toe-tapping sounds of live music, learn more about the styles, tastes and smells of whiskey from a local distillery’s knowledgeable educators, who will be presenting live snapshot seminars throughout the event including Elkins presenting on the challenges of high altitude distilling and how all their materials are sourced from Colorado. Enjoy a local cigar shop selling products and demonstrating cigar rolling, to enjoy alongside your favorite whiskey. Cost: $10/Youth (5 – 18 Years), $13/Adult, Two-Day Packs and Family Pricing available. Tickets here. The Fourth Annual Rocky Mountain STEAM Fest is coming to Boulder County Fairgrounds! Featuring over 100 exhibits and hands-on activities, STEAM Fest brings the best of Arts and Science to the Front Range. Activities include arts & crafts, robotics & electronics, building and making and so much more! This event is mostly indoors and happens rain or shine. Bring the whole family (or come alone! ), you’ll want to roll your sleeves up and participate in the activities, learn from the experts, and build awesome new things. Presented by Maker Bolder. The time has come… to catch the epic Chautauqua white wave with Satellite Boardshop. Join Satellite for some retro snowboarding and face shots of powder! Meet at the bottom of Chautauqua park in Boulder at 9AM and where boarders will be lapping the front face of the mountain all day. Cost: $5 Students, $20 Faculty/Staff, $40 Public. Tickets available here. Anderson Cooper, an award-winning journalist and host of CNN’s Anderson Cooper 360°, will speak at Macky Auditorium on March 6. The Distinguished Speakers Board, a CU Boulder student-led organization, is hosting the event. Cost: FREE, No tickets necessary. The greatest romance in all of English literature gets a wacky, rhyming makeover with Backstory Theatre‘s Seussified Pride and Prejudice. The Bennet girls have a chance to meet well-to-do gents at the Ding-A-Ling Prance Dance, but there might be some relatives in the way before they can ride off into the sunset on Honk Jingle Horses. This whimsical retelling is something Dr. Seuss might come up with if he had his way with the time-tested Jane Austen classic. This performance is produced, directed, staged, and performed entirely by teen actors and members of the BackStory Youth Leadership Program! For more information about BackStory, visit www.backstorytheatre.org. Where: In and around Nederland, see festival map here. Time: See full festival schedule here. Cost: Some events are FREE to watch, Music tents $15 for weekend pass, Blue Ball $20/person, VIP passes $150. For VIP ticket info, click here. For Blue Ball tickets, click here. Known as one of the most unique and quirky festivals in America, Frozen Dead Guy Days takes place in the mountain town of Nederland, just thirty minutes from Boulder. The festival, celebrating its 17th year, features three days of frosty merriment including 30 live bands in heated super tents and outrageous events like coffin racing, costumed polar plunging, the Blue Ball, frozen t-shirt contests and much more. The home-grown frosty fest pays homage to Bredo Morstol, who is frozen in a state of suspended animation and housed in a Tuff Shed on dry ice high above Nederland. Thousands of adventurous, life enthusiasts come to participate in Colorado’s “most frigidly fun festival” and view the events along with local, national and international media and entertainment. Cost: Early Bird $15, GA $20, At the Door: $25, Tickets available here. Boulder Lip Sync Battle is an annual community event which brings people together to celebrate the art of performance. Much like the television show, contestants battle one another to perform hit songs paired with professionally designed lighting and stage effects. Get tickets now and don’t miss this one-of-a-kind Boulder experience! Interested in performing? Register here! Boulder Lip Sync Battle was founded with community in mind. A portion of the proceeds will go to The Catamounts. Cost: $8/Person. Children 6 & Under FREE. Tour this beautiful 1913-1914 historic home, built by Charles L. Hover and his family. On these tours, docents guide you around historic Hoverhome where you will learn about the Hover family and their involvement in Longmont and beyond. Tours start on the hour at 1, 2, and 3 pm and last about an hour each. No rsvps are needed. Fees and donations collected help support the continued care of this historic home. Join Outlaw Yoga for this FREE class at Bootstrap Brewing followed by some tasty beverages. Donations collected will support the Give Back Yoga Foundation. Boulder Lifestyle Magazine is throwing its 5th Anniversary Party, and you are invited! Family friendly, with kids activities, food trucks, beer garden, and a very special live concert with Arthur Lee Land‘s new side project, TWANG IS DEAD (high energy / twangy versions of Grateful Dead tunes). Join St. Vrain Cidery is hosting dancers from Moriarty-Moffitt School of Irish Dance for an Irish dance performance. Sit back, enjoy a fresh cider and enjoy this show from Longmont’s own as they gear up for St. Patty’s day weekend! Time: Varies, See schedule here. Cost: $18 – $20, Tickets available here. The Longmont Theatre Company presents a comedy about family vacations will have audiences reminiscing and laughing, Leaving Iowa. A middle-aged writer returns home and decides to finally take his father’s ashes to his childhood home. When he discovers that his father’s house is now a grocery store, he travels across Iowa searching for a proper resting place for his father. KBCO, Denver Westword, and Twist & Shout Records present G. Love & Special Sauce in a special St. Patrick’s Day concert with Ron Artis II & The Truth at The Fox Theatre. Join Macaroni Kid for its 2nd Annual Summer Camp & Activities Expo to help parents find the perfect camps and summer activities for their kids! This year, the event falls on March 17th, St Patrick’s Day. The event will feature bagpipers, Irish dancers, fiddlers, prizes, face painting, lots of games and kids crafts. A free, outdoor concert featuring Jeff & Paige by the new, top-of-the-line library playground. Sponsored by your City of Boulder’s Open Space and Mountain Parks Department as a thanks to our community, and a celebration of the future of Boulder’s undeveloped lands. In addition to the kids’ show there will be “Get to know your neighbors” learning stations, a values, hopes and concerns public art project, a drum circle and (hopefully) a chai garden. Every Spring, the students of the Jack Kerouac School of Disembodied Poetics and the students of the MFA Theatre: Contemporary Performance, have collaborated on original, student created works. This year, the performance graduates will once again be lead by Joan Bruemmer-Holden in renditions of creative works by the writing graduates in the 12th Annual Embodied Poetics Performance. Cost: $30 – $40, Register here. Colorado Brewery Running Series presents this 5k-ish Run for Beer that all starts and ends at Oskar Blues Boulder Taproom. We welcome all runners, walkers, joggers, and spectators that are interested in enjoying the great outdoors and the great craft beer that Colorado has to offer. All of our participants complete a 5k course nearby each brewery. Afterwards, everyone hangs out, drinks beer, and enjoys local, live music! Time: Times vary, schedule here. Cost: $12.50 – $21, Tickets available here. See one of the most enduring shows, Tim Rice and Andrew Lloyd Webber’s Joseph and the Amazing Technicolor Dreamcoat at Jester’s Dinner Theatre in Longmont. The irresistible family musical is about the trials and triumphs of Joseph, Jacob’s favorite son. The saga of Joseph and his coat of many colors is brought to life in this delightful musical parable. Set to an engaging cornucopia of musical styles — country-western to calypso, bubble-gum pop to rock & roll — this tale emerges as both timely and timeless. Cost: $25, Tickets available here. Join Cat Pantaleo, Certified Forest Therapy Guide, for a rejuvenating walk and a sensorial feast! Revive your weary spirit and boost your immune system! Forest Bathing is much more than a hike in the woods. Based on the Japanese practice, Shinrin-yoku, it is experiencing the forest with all of your senses attuned. Unlike a hike, a Forest Therapy Walk’s destination is inner calm. It is a slow saunter, on and off trail, that consists of facilitated “invitations” that create opportunities to: Slow Down, Rejuvenate, Relax, and Play. The experience of bathing in the atmosphere of the forest with all of your senses, is one of deep connection with the profound beauty and healing power of the natural world. Each walk ends with a sharing of tea made from local plants/trees. Cost: $10 – $125, Tickets available here. Kids under 12 are FREE. 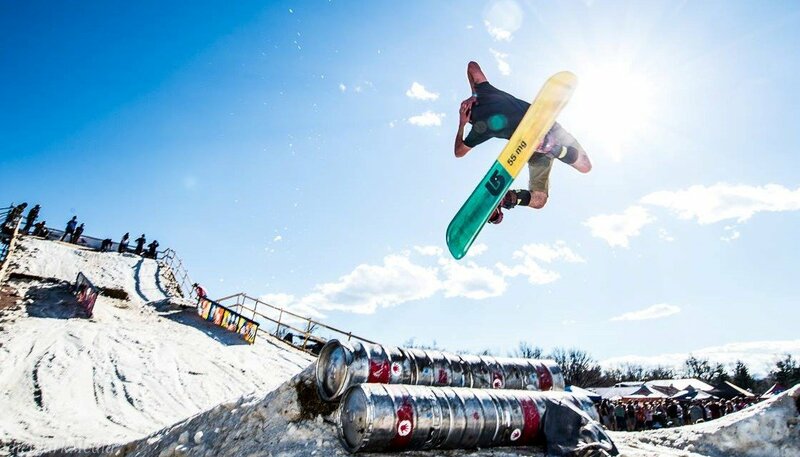 Back for its sixth year, Hops + Handrails Beer Fest & Rail Jam, returns to Longmont with the support of Winter Park Resort, Burton Boards, and the Satellite Board Shop. Day 1 will feature a 40’ high snowboard ramp & rail jam competition with the support of Winter Park Resort. Only at Hops + Handrails can guests enjoy unlimited samplings of over 60 craft breweries while soaking up the Colorado sun in front of a four-story ramp in the middle of town. Skiers and boarders will throw down big air and their gnarliest tricks on the ramp, trick rails and keg wall in men’s and women’s categories. Day 2 will be a family-focused winter wonderland featuring a sledding & tubing hill. For more details, click here. Where: Various locations around Boulder. Cost: Costs vary depending on event, click here for details. The 5th annual Boulder Arts Week will take place on March 30 to April 7, 2018, at venues throughout the city. Celebrating Boulder artists, the week is Boulder’s only large-scale, inclusive celebration of our community’s vibrant arts and cultural offerings, promoting and celebrating our city’s thriving creativity. Join Boulder to celebrate the city’s excellent artists and arts and culture offerings such as art walks, First Fridays, exhibitions, performances, dance, music, theater, public art, artist demonstrations, lectures, readings, and workshops. Cost: Admission: Boulder County Residents, Museum Members and Children under 2 are free, Children $5, Adults $10, and Seniors $8. Ride Tickets: Boulder County Residents Free, Adults (16+) $4, Children (2-15) $2. Museum members receive $1 discount per ticket. Boulder Shambhala Center invites you to discover meditative arts at Spring Arts Day. Demonstrations and hands-on classes. A work of art is created because there is basic sacredness, independent of the artist’s particular religious faith or trust. Sacredness from that point of view is the discovery of goodness, which is independent of personal, social, or physical restrictions.” – Chogyam Trungpa Rinpoche. For the full demonstration schedule, click here. Children are welcome. This is a free program, open to all! Get ready for the coolest Easter egg delivery ever at the Village at the Peaks Easter Egg Drop! Mile-High Skydive will be kicking off the event with live skydivers at 12:30pm! (Conditions permitting). There will also be tons of other fun and FREE activities for the whole family, including: Easter Bunny with Photo-Op, princess performances on the stage, train, face painters, balloon twisters, easter crafts, music, games and baby goats. Bags of stuffed Easter eggs for kids will be handed out at the Village at the Peaks registration tent while supplies last.